Lorsque les attentes rencontrent la réalité. - Prise en charge gratuite à l'aéroport lors de la réservation pour 3 nuits. - Salles de bains à l'intérieur. 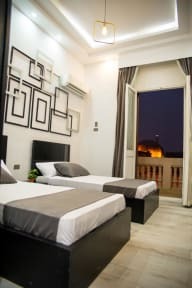 This hostel is the must if you want to visit Cairo and its surroundings for cheap. The staff is adorable and ready to help you in any way possible. 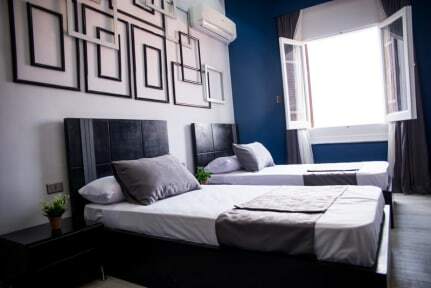 The rooms are super clean, and the location is just perfect. Just go for it !!!!!! Impossible de trouver mieux placé. Le personnel y est agréable et l'hostel est propre. Cependant, attention aux prestations proposées, vous trouverez facilement moins cher autre part. Relación Calidad/Precio es correcta. La gente de la recepción muy acogedora y amigable. Único detalle que fuman mucho y si hace frío no se puede ventilar correctamente el humo. De todas formas se les puede pedir que ventilen y lo harán sin problemas. Sobre las habitaciones se corresponden a las fotos. Il faut définir une zone fumeur dans l"établissement car les parties cummunes sont espace fumeur !!! ce qui est très désagréable !!! Problem with my room the 1st night, they had to drive me to another hostel at 1am, of lesser quality, which looked like I was sleeping at someone's apartment. At least they adjusted the price. The only complaint about this is that I should have been contacted in advance to explain the problem. DON'T come here. The staff smokes in the public area. Every time I meet them they're trying to sell their overpriced tours (don't buy them. Just get an uber) Lied to my face that I can't get an uber in Giza (you can). Went on their tour and it consisted of me going from one place they could sell me things, to another. There was no hot water during my stay, and there were mosquitoes. Maybe if they weren't so desperate for tourism will the tourists actually come. Buck up.